Fact: the majority of newly acquired donors flee after their first gift. These lost donors represent major lost potential — for your annual giving program, your capital campaign efforts, your major and planned gifts. Acquisition without retention is a costly, wasteful treadmill. 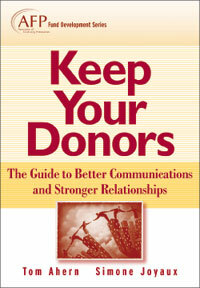 Get your fundraising program off that treadmill — by adopting the highly effective strategies and tactics explained in this new Wiley/AFP title, Keep Your Donors: The Guide to Better Communications and Stronger Relationships, by experts Simone Joyaux and Tom Ahern. Keep Your Donors helps make disappointing donor retention rates a thing of the past. For the first time in one book, you’ll find an in-depth analysis of the two things that matter most to long-term fundraising success: relationship building at all levels of your organization; combined with a practical, in-depth examination of effective fundraising communications. Topics of special note in this book include creating a “culture of philanthropy”; understanding “the predisposed”; applying hard-core marketing principles to fundraising; the most complete discussion of emotional triggers ever written (including the science behind them); creating plans for both relationship- building and donor communications; the characteristics of truly “donor-centered” programs; story-telling methods; how to write a case for support; measuring effectiveness…and much more. View Table of Contents and chapters at Amazon.com. Buy books from the publisher or Amazon.